On St. Patrick's Day this year, I didn't do anything in particular to commemorate the day, but I did go to a friend's bridal shower with my mom. As we drove through the downtown area of the town where the shower was, I saw people up and down the streets, wearing green, out enjoying the freakishly nice weather. At one point, a group of women ran across the street, laughing. They were totally decked out in St. Patrick's Day decorated shirts, wearing giant shamrock headbands, just a completely tacky display of holiday cheer. There's some refreshing about choosing to wholeheartedly and joyfully celebrate a holiday. About choosing to be trusting, not skeptical. Or to be earnest, instead of cynical. I thought about this moment this past weekend, seeing the mixture of Easter-related tweets and Facebook statuses talking about chocolate candy, Jesus' resurrection, and the Easter bunny. Easter is about joy. In the Catholic church, we sing "Alleluia!" loud and proud after not hearing the word for six weeks. We proclaim that our God's love is greater than even death, and we celebrate. And so it saddens me when I see Christians stomping on others' Easter joy with admonishments to remember that Easter is about Jesus, not chocolate, and bemoaning the secularization and commercialization of the holiday. Because honestly? I don't think those "This is what Easter is really about" comments lead anyone to Jesus. There are so many terrible things in this world -- disease, hunger, war -- that we could be focusing our efforts on eradicating. Why focus on eliminating things that make other people happy? It's the same with Christmas. In my family, Christmas is a time for family to come together, to eat deliciously fattening food, to listen to overplayed holiday songs, and to give each other presents. Technically none of these things have to do with Jesus' birth. But are they really detracting from "the reason for the season"? Those of us who are Christian still go to church on Christmas Eve and still take the time to reflect on God becoming man. Those who are not, don't, but they still participate in our joyful Christmas celebration as a family. In my department at work, we had a holiday party where we all brought in food and gifts and went around telling each other "happy holidays." It was such a fun and happy event, and I couldn't help but feel that it better captured the "spirit of Christmas" than if there'd been an event for only those who believed in Jesus, who told each other "Merry Christmas," and who didn't speak about Santa or other "commercial" aspects of the season. Isn't a joyful holiday better celebrated with as much joy as possible? Maybe there is a real danger posed by secularization and commercialization, that all of us Christians are going to forget why we commemorate these dates in the first place, but I just don't see it. I feel like expanding religious holiday celebrations to be inclusive of many more people, even in weird and funny ways, is a better way to bear witness to the love of Jesus than to keep them narrowly and exclusively focused. I'm with you. There are so many different ways to celebrate and I feel like people shouldn't put others down because they like to celebrate a certain way. Take Christmas for example. I know of a of a lot of Christians who are so "SANTA CLAUS IS TERRIBLE" and get all upset about how we shouldn't recognize Santa. My family LOVES Santa. My dad still insists that all of his presents say "from Santa." He's one of the strongest most traditional and faithful men I know. He actually talks about how Santa reminds him of Jesus sometimes. And what's wrong with eating and having chocolate? Even in the Bible people used food to celebrate. Why should we tell others they can't party to celebrate? That's so fun that your dad is so enthusiastic about Santa :) You are definitely right that food has always been incorporated into celebrations, even religious ones. 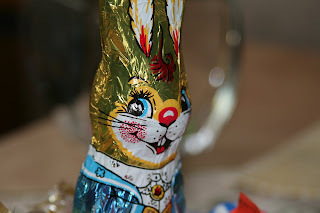 In my experience people aren't as upset about having Easter parties or Easter chocolate per se, but having that in place of a religious celebration. But if people aren't Christian, they are not going to celebrate Easter as a religious holiday regardless. So the question is, is it better for them to not celebrate Easter at all, or to celebrate a secularized version of Easter with food and the Easter bunny? I don't personally have an issue with the latter choice because I don't think it's taking anyone away from Jesus, and being all angry and trying to get people to stop what they're already doing may actually drive them further away from Jesus. That's my perspective on it. I agree completely. Holidays are supposed to be about having fun, being with your family and just having a happy joyful day. Of course some holidays have a religious foundation, and that that is really what the holiday is about, but that doesn't mean the only way to celebrate that is to sit and ponder about religion all day. People who are religious will of course still remember the day for what it really is, there's no need to slap them with a bible just because they enjoy telling their kids Santa is coming and stuffing their face with chocolate for Easter. I thought Jesus was all about bringing people together, no matter what their background. Just because you're religious doesn't mean you have to be a total bore and ruin a holiday just because others don't follow 'the rules' exactly. It's good to remember what the holiday is about, but people should lighten up a little and just enjoy a celebration and not slight other for not thinking about the religious origins. Right, and especially for holidays that are intended to mark positive religious events -- e.g., Jesus' birth, Jesus' resurrection. I could understand people getting upset if, say, Good Friday somehow got turned into a secular party holiday because that really is more of a solemn religious holiday. But for Christianity's most joyous celebrations? I say the more love, joy, and togetherness, the better. I can't understand people who think that we will all be more excited about Jesus by being lectured on how bad we are for thinking about anything else. If he's so exciting--talk about Him! Your comment reminds me of the great phrase Jon Acuff coined: "The Jesus Juke." It's taking a light-hearted conversation and suddenly making it serious and Jesus-related. As he says, he doesn't know anyone who was "juked to Jesus." You've got a good point. I agree that festivities with no obvious direct connection to religion are fine, and at this time of year I find celebrating the return of flowers and bunnies and chicks and sunshine to be a religious observance: God gives us all these things, and in God's wisdom we have a cycle of seasons that helps us appreciate each one anew every year. However, I never taught my child that the Easter Bunny or Santa Claus is real. We participate in events pretending about these things (and I have taught him it's not polite to tell other kids not to believe!!!) but we don't do much pretense in our own family. I just was not comfortable lying to my child about a magic bunny in the same season when I am telling him incredible truths about Jesus--both stories are illogical and miraculous, so I reserve the enthusiasm for the story I want him to truly believe. It's worked well so far! For Santa, I really like the explanation Laura Ingalls Wilder's Ma gave her, that Santa is REAL through the kind and giving actions of many people. I can definitely understand that. I'm kind of torn myself because I dislike the thought of trying to keep up the pretense of the Easter Bunny, Santa Claus, or the Tooth Fairy. (And some kids are totally freaked out by the idea.) But then I know that Mike lives for this kind of stuff, for the fun of getting to play Santa and having our kids all excited and wide-eyed about him. And I can also see the point of Elizabeth Esther's "In defense of Santa Claus" post about encouraging imagination and play (although she goes a little over-the-top in her sarcasm as usual, which is one of the reasons I eventually unsubscribed to her. But anyway...). So I can understand your decision, definitely. And I don't see you openly scorning other parents for making a different decision, which I appreciate and which was the main point I was hoping to make here. It's one thing to choose to celebrate a holiday a particular way; it's another thing to consider it your duty to ensure that nobody else celebrates the holiday a different way.